BioNetwork’s activities are designed to build student interest in STEM careers. Each is aligned with NC Community Colleges learning outcomes and grades 6-12 essential standards. While filming a new episode of the paranormal TV show, Spirit Tracker, the show’s camera operator goes missing. The location is said to be haunted. Is her disappearance the result of otherworldly forces, or is it foul play? Private investigator, Sam West, is on the scene, but it's up to the forensics team to solve the mystery. Students run the crime lab and use forensic science to test each piece of evidence. Experiments include electrophoresis, chromatography, blood typing, tread analysis, and powder identification. Why should my college host this event? Middle school is a critical age for career exploration, and BioNetwork provides all of the materials to make it easy for your college to reach out to these young students. With the ready-to-go EASE program, you'll introduce future students to your faculty, facilities, and programs. Impress your community stakeholders, administration, and board of trustees. An event like this is guaranteed to bring positive press to your campus. BioNetwork conducted a pilot program with students from West Craven Middle School. "What a fantastic opportunity to introduce students to STEM careers! BioNetwork’s EASE program engaged our students in authentic assessment. They were able to use 21st century skills, collaboration, and higher order thinking strategies to solve a realistic crime scene scenario. Programs like this can really build a college and career pipeline starting in the middle school classroom." So are you ready to recruit with EASE? Contact our Engagement team to learn how. If you have questions or would like to learn more, you may also contact Tanya McGhee, Senior Director of Engagement. Would you like your students to participate in EASE? Contact our Engagement team, and we'll connect you to your local community college. 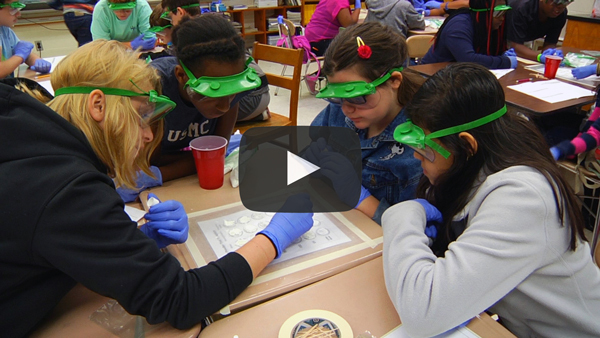 Learn about the basic structure of cells and DNA as you extract DNA from a strawberry. Discuss potential applications for DNA extraction. Take a self-guided exploration of a common laboratory microscope including its care, components, and usage. This eLearning module will give you an understanding of the process used to develop drugs and why it costs so much to bring a new drug to your pharmacy. This module includes, the basics of centrifugation, effects of gravity on particles in suspension, operation of a centrifuge, differential centrifugation, basic components, hazards and safety. This animation explores the fundamentals of gel electrophoresis by covering equipment setup and use, loading of DNA samples as well as concepts of molecule separation, gel analysis, and common electrophoresis applications. Learn how to use an analytical balance. In this video, we'll explore the steps and techniques required to set up, take measurements, and clean the balance.